During the commissioning process, we had long discussions about which yarns we wanted the designers to use in their submissions. Our criteria were fairly straightforward: they had to be yarns we absolutely loved, widely available in quantity, and come from brands with a range of options in weight and fibre mix. After some to-ing and fro-ing, we settled on three of our all-time favourite brands: Fyberspates, Jamieson & Smith, and Schoppel Wolle. Fyberspates has a deserved reputation for beautifully dyed luxury yarns. We've worked together on many projects over the years, stretching right back to The Scrumptious Collection, volume 1, which was the first book I worked on when I started my technical editing business. Jeni's yarns are yarns that I return to again and again, so we knew that we wanted to feature Fyberspates. The Scrumptious yarns have a mix of merino and silk that gives them an instantly recognisable sheen, as well as richly saturated colours. 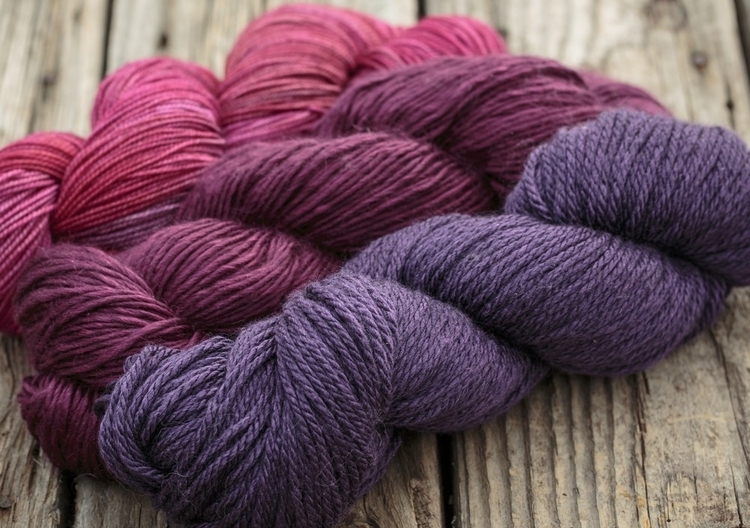 Vivacious is all merino and is perfect for making the softest garments and accessories. The Cumulus range is a heavy lace weight alpaca/silk mix and has a distinct halo, so that you feel like you're wearing a cloud. Fyberspates also produce Socks Yeah! with Rachel Coopey. The way that this versatile sock yarn is dyed is really very clever, with fibres of the other colours in the range mixed in so that all of the yarns combine exceptionally well together. Jamieson & Smith are well known for their 2ply Jumper Weight, Shetland Heritage and Shetland Supreme yarns, available in a spectrum of natural and dyed colours, that are perfect for stranded colourwork. We first worked closely with them on their spectacular Knit Real Shetland book back in 2011, and I've been returning to their wonderful ranges ever since, both in my own designs, but also in my knitting projects. I could while away many happy hours in their Lerwick shop, putting together colour combinations and chatting with Sandra and Ella about knitting. The wool for J&S yarns, blankets and carpets all comes from the Shetland sheep of the crofts across the Shetland archipelago. In addition to their woollen-spun ranges that are ideal for colourwork, they have in recent years introduced a range of worsted-spun yarns that give a different finish in colourwork, and offer great definition for textured stitch patterns and cables. Schoppel Wolle are a German firm, probably best known for their Zauberball range. Indeed it was in 2009, while working at The Knitter, that I first came across a Zauberball and cast on for what became my first published design - Spiralling Socks. Jim still wears those socks all the time, and the bright rainbow colours make me smile whenever I see them. Over the years I've made a few projects with Zauberballs, and it's been great over the last few months to discover more of their wonderful yarns. The strong, vivid colours jump out and you are rarely in doubt that you are looking at a Zauberball in your LYS, even when you can't see the tag. While looking through the whole Schoppel Wolle catalogue, we discovered that they produce a whole heap of incredible gradient and space-dyed yarns. Beyond the familiar Zauberball range, there are Reggae Ombre, Gradient and 6 Karat as well as Flying Saucer, Big Disk and Wunderklecks. So many fun, colourful yarns to try, and never enough knitting time! Schoppel often use a fascinating Reggae felting technology, in which the fibres are steamed during the spinning process, resulting in a yarn that has an unusual, but incredibly soft texture. The innovation in how wool is turned into yarn is something that appeals to us, as does the warning on every ball band: Stricknen kann süchtig machen! (Knitting can be addictive!). We will be offering seasonal kits to accompany A Year of Techniques, with the yarns you will need for three months worth of projects, plus an exclusive A Year of Techniques bag to carry your knitting around with you. The spring kit for March to May will be on sale later this week when pre-orders open. Mason-Dixon Knitting will also be stocking kits for A Year of Techniques, and they ship to the USA and Canada only. Nearly there now!